After a year solid direct action and public pressure campaigns from grassroots organizations all over the country, Fannie Mae agreed to meet with us this past week to, discuss policies that many believe are holding our communities hostage, to discuss 98 homeowner/tenant campaigns that need to be resolved asap, and to develop a direct line of communication moving forward. 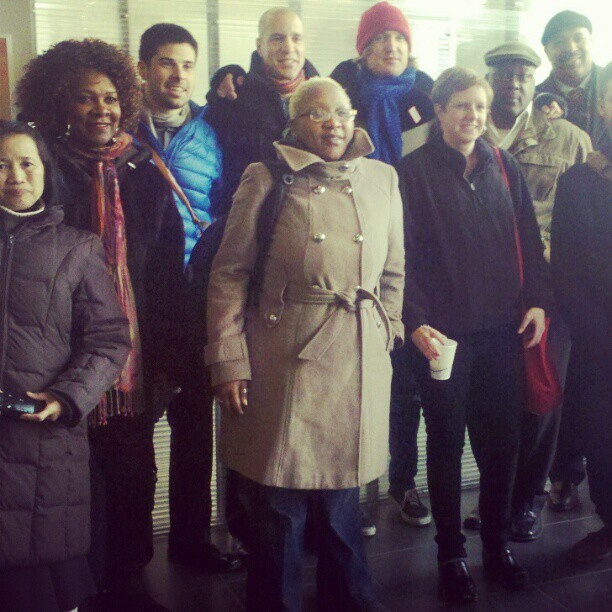 I was invited to attend the meeting along with 12 other housing justice organizers. 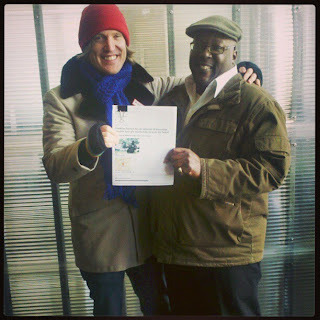 I was especially excited that Mark Harris, a homeowner with an active campaign against Fannie Mae, was able to travel with me from Atlanta to Washington DC to represent his case in person and to deliver his online petition. We were set to meet with three high level Fannie Mae officials; The communication’s Director, the vice president of sales, the vice president of REO fulfillment. One thing that was made clear at the beginning of the meeting was that any principle reduction was off the table. Fannie may was put under federal conservatorship after the government bailed Fannie Mae out. That means that Fannie Mae is now overseen and forced to comply with FHFA, which is run by Ed DeMarco. Ed DeMarco has said that he believes that principle reduction presents a moral hazard for America despite moderate voices like President Obama and Secretary of Treasury Timothy Geithner calling for some sort of mass principle reduction that would act as a people’s bailout.
" I went to D.C. to get principle reduction. That did not happen, but i did learn more about the process. This action is like chopping down a tree. Each sing of the ax weakens the tree and at that very instant the tree falls under its own weight. I lean not to my own understanding!!!" stated Mark Harris after the meeting. Many of the systemic changes we have been pushing for are above the heads of those we were meeting with, so the fight must continue. Ultimately the removal of Ed Demarco would be a major victory, and it’s been heard through the grapevine that Obama said he would do it after the election. It’s up to us to make sure he doesn't put that on the back burner. Today is a day to reflect on the legacy of Dr. King, and for many in Atlanta it's a day to retrace the great man's foot steps from Peachtree street, down Auburn avenues, all the way to Ebeneezer Baptist Church. This year I had the extreme honor to March as a dignitary for the second year in a row and speak at the rally at Ebeneezer. 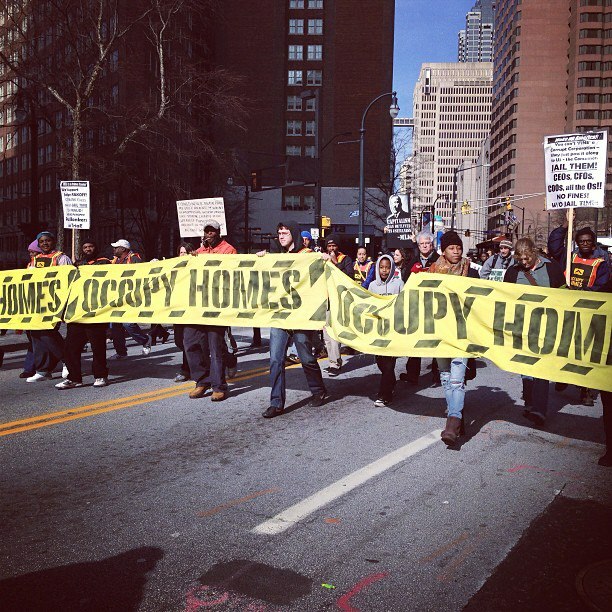 Usually AFSC organizes an anti-war contingent in the march but this years mobilizing efforts went toward supporting the efforts of Occupy Our Homes Atlanta in building a large housing justice contingent in the march. Knowing that I was to speak in the march I spent a great deal of the last few days thinking about what brief comments I might say from the stage. It my be a cliche, but Dr King's work and writing has done more to inspire my work and life direction then anything else. This week I've been thinking a lot about poor peoples campaign, the last campaign Dr King organized. In November 1967 Dr King and the SCLC organized the campaign to address economic injustice and housing for the poor in the United States, the aim was to rebuild America's cities. The Poor Peoples Campaign didn't just focus on poor black people but addressed all poor people. Dr King labeled the campaign as "phase two" of the civil rights movement- setting goals like gathering activist to lobby Congress for an "Economic Bill of Rights", Dr King also saw an crying need to confront a Congress that demonstrated a hostility toward the poor yet provided an over abundance to the military industrial complex. 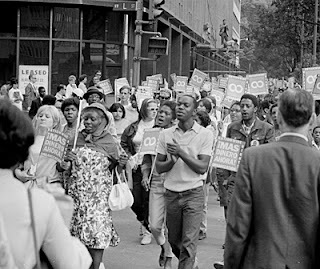 Under the "Economic Bill of Rights" the Poor Peoples Campaign asked for the federal government to prioritize helping the poor with an antipoverty package that included housing and a guaranteed annual income. Martin Luther King Jr wanted to shut down Washington DC. Poor Peoples Campaign was to be the longest running protest in the nations capitol. Dr. King intended to dramatize the suffering of the nations poor by bringing them to the capitol. Poor people would live together on the national mall, between the capitol and the Lincoln memorial- and engage in widespread civil disobedience. King wanted to force the federal government to deal with poverty. 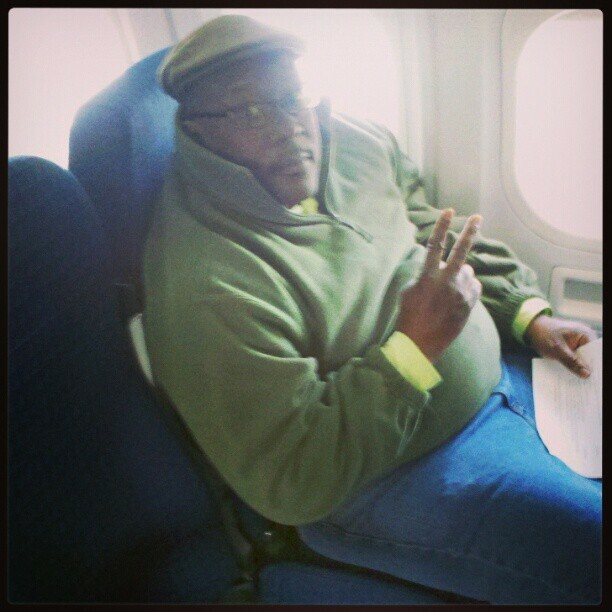 After Kings assassination the King family, along with the SCLC, decided to go on with the campaign to honor King. On May 12th, 1968, the first wave of protesters showed up. 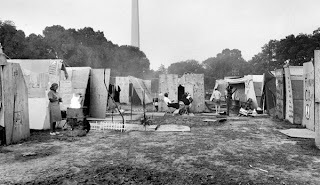 One week later Resurrection city was built on the Washington Mall, a settlement of tents and shacks to house protesters. Demonstrators were sent to various federal agencies to protest and spread the message of the campaign. Sadly the campaign lacked the leadership and momentum Kings involvement might have brought. The combined setbacks of RFK's assassination, and a series of bad press further limited the campaign success. Failing to force a response from lawmakers, the poor peoples campaign closed camp on June 19th 1968. It should come as no surprise that many veterans of the civil rights saw the Occupy movement as an extension of Dr King's work and legacy. As you begin your second term in office next week, we hope you will let the U.S. public in on one of Washington’s best-kept open secrets: We’re not broke. Of course, you – along with many on Capitol Hill – know full well that the dire warnings of disaster if we do not drastically cut safety net programs, enforcement of environmental protections, or job creation and training initiatives are patently false. We are a wealthy nation with the means to secure the common good for generations to come. But like a family blowing our money on luxury vehicles – such as the $610 million-per-plane F-35 – while failing to keep a roof over our head, we urgently need to reexamine our priorities. Our federal budget should reflect the things that make us a thriving, sustainable, secure society. Instead, nearly 60 percent of the discretionary budget is now directed toward an incredibly narrow definition of security—the Pentagon budget and other military-related spending. This grossly disproportionate national “security” spending is making us deeply insecure. Think about the $610 million spent on just one F-35 plane—how far would that go to address the 10,000 homeless people who sleep outside in Atlanta every night? Instead foreclosed homes crumble in southwest Atlanta while the homeless population has grown so large it’s now a large economic class of Atlantans. What could one or two F-35’s do for the 55% of Atlanta’s homeowners who are, on average, $66,496 underwater on their mortgages? Mr. President, we appreciate that you have begun to publicly question the double standards so often applied to Pentagon spending. Now the time has come for you to help the U.S. public understand the fiscal and human toll this double standard has wrought. The end of the 1990s is remembered fondly as an economic heyday, a time when we saw budget surpluses and a thriving economy. 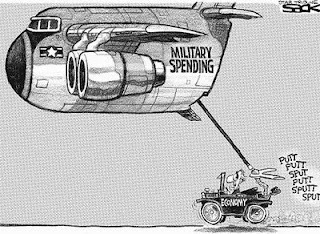 What is given less attention is that at that point, military spending amounted to less than half of what we spend now in inflation-adjusted dollars. We could afford to invest in job creation, a sound safety net, education programs, and other priorities that built our nation’s most fundamental security needs. But since that time, U.S. military spending has doubled—beginning well before the events of September 11, 2001. In fact, the Pentagon routinely struggles to spend all the money it is allocated, and ended FY12 with $100 billion in unused funding sitting in its bank accounts waiting to be spent. Yet the Pentagon remains the only part of the federal budget not subject to audit, with documented levels of waste that far outpace the entire budgets of critical human needs programs. Let’s cut what we don’t need so that we can protect the things we do, Mr. President. If the sequestration deal is left intact, it still will only return Pentagon spending to 2007 levels -- a time when the U.S. was at war in two countries. That is an inadequate reset in the runaway Pentagon spending we have seen, extravagant spending that has ballooned the salaries of the top five defense contractor CEOs to an average $21.5 million apiece annually while millions of children in the U.S. aren’t sure where their next meal is coming from. As you develop your FY14 budget, seize this moment to lead us toward real budget reforms. Let’s bring our Pentagon spending back to the pre-war levels of 2002 and make needed investments in job creation, education, healthcare, and the environment. Mr. President, this is your year. You have all the hard-won experience of your first term under your belt, an experienced staff, and the momentum of a clear mandate from the November election. It’s time to be bold and lead this nation toward new priorities—because there is no more room in the budget for what we don’t need. What we do need is real security: good jobs and schools, affordable health care, environmental protections to keep us safe from disastrous changes in climate, accountable institutions upholding justice for all. We’re not broke – but this nation will become increasingly broken if we don’t change our budget priorities. R. Aura Kanegis serves as director of the Office of Public Policy and Advocacy of the American Friends Service Committee (AFSC). Tim Franzen is the Georgia Peace and Conflict Resolution program director for the American Friends Service Committee. 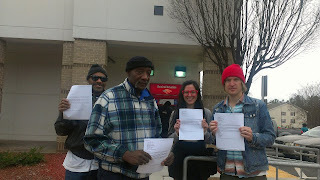 This past week small delegations and individuals all over the country delivered a letter to Banks of America branches written by Georgia home owner JoSelf Freeman. Bank of America branches all over including Georgia, New York, California, Florida, Texas, and Minnesota, received visits from folks with one simple message; make a deal that keeps a roof over JoSelf and his family. While Bank of America representatives have been calling JoSelf as a result of all the visits, there has yet to be a solution found. We hope that Bank of America will step back from their plan of eviction, but it's clear that folks from JoSelf's community, and people around the country, are down to stand beside JoSelf if Bank of America decides to move forward with their eviction plan. It's not too late to send your own message to Bank of America in solidarity with JoSelf. Just click here for some creative ideas! American Friends Service Committee has partnered with Occupy Our Homes Atlanta to provide volunteers and supplies in the effort to experiment with mutual aid projects. 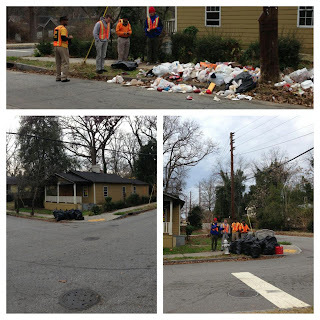 We plan to work with residents to identify streets that have an abundance of trash, many times vacant homes are used as unauthorized dumping spots for folks inside and outside the community. Once we have chosen our next clean-up site we will work with volunteers and community members to go door to door and invite the folks on the street to join us for a mutual aid project. 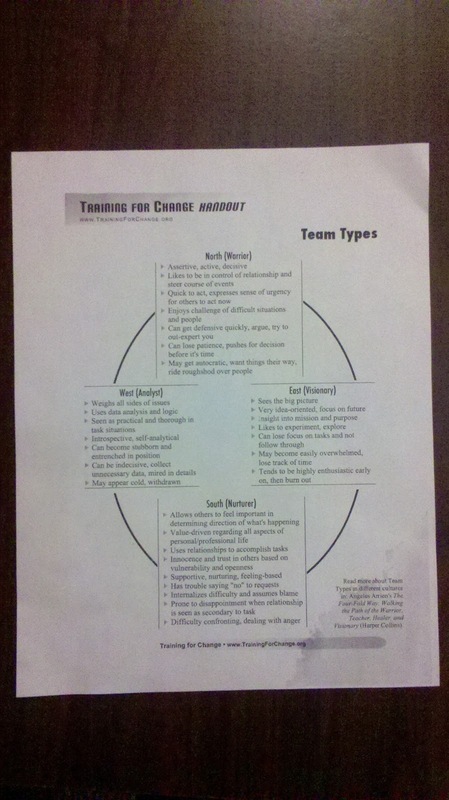 After trash is picked up we facilitate a brief meeting on the concept of mutual aid and try to identify skills folks may have to share with their neighbors. One hope is that other mutual aid projects will come out of these simple clean ups. The goal is two clean-ups per months, with means 24 streets this year. I thinks it's going to be a great way to get a deeper understanding of the Pittsburgh community and build stronger relationships the the neighborhood. American Friends Service Committee continued it's series of organizing workshops yesterday. 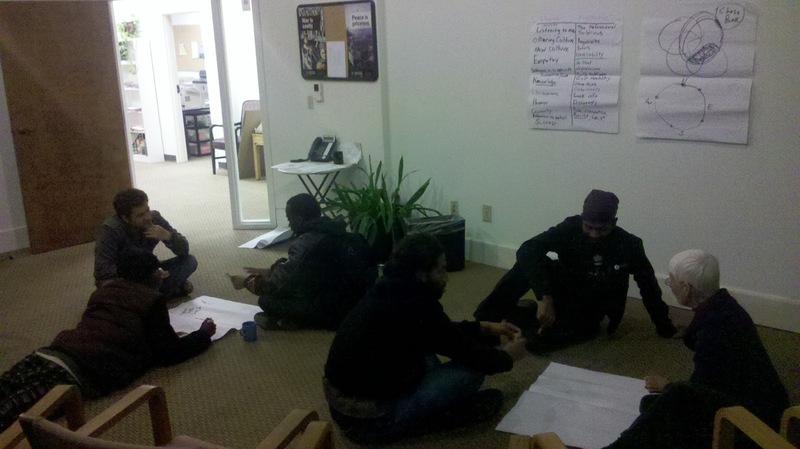 Last nights workshop focused on the personal and group dynamics that can make or break activists organizations or movements. Success has always been determined by effective relationship building and by learning how to work with a variety of people and oter organizations. 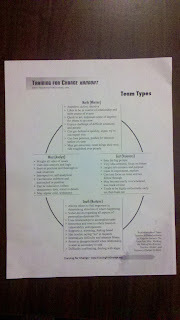 We explored how to spot and avoid unhealthy organizing moralities in ourselves, and ways to keep others in check. Our next training will be held in February and will focus on understanding the spectrum of allies and effective ways to pull community towards your issue and neutralize active opponents.